H IS FOR HAWK meets GRIEF IS THE THING WITH FEATHERS in this evocative debut novel about a pill-popping anesthesiologist and avid birder who embarks on a quest to find one of the world’s rarest species, allowing nothing to get in his way --- until he’s forced to confront his obsessions and what they’ve cost him. Adrian Mandrick seems to have his life in perfect order with an excellent job in a Colorado hospital, a wife and two young children he loves deeply, and a serious passion for birding. His life list comprises 863 species correctly identified and cataloged --- it is, in fact, the third longest list in the North American region. But Adrian holds dark secrets about his childhood --- secrets that threaten to consume him after he’s contacted by his estranged mother, and subsequently relapses into an addiction to painkillers. 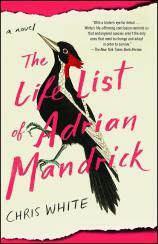 In the midst of his downward spiral, the legendary birder with the region’s second-longest life list dies suddenly, and Adrian receives an anonymous tip that could propel him to the very top: the extremely rare Ivory-billed Woodpecker, spotted deep in the swamplands of Florida’s Panhandle.